Sarasota County, located on Florida’s picturesque Gulf Coast, is the perfect blend of cosmopolitan lifestyle and seaside oasis. A plethora of performance arts and entertainment options, the highest concentration of Zagat-rated restaurants in FL and a vibrant downtown district, combined with 35 miles of tranquil shoreline, including TripAdvisor’s #1 beach – Siesta Key, are just a few of the features that create our unique balance of small town charm and big-city amenities. Combined with over 5,000 hotel rooms, a variety of meeting spaces, a local international airport servicing major cities nonstop and numerous CVB resources – including a brand new incentive program, Sarasota County has all of the ingredients for an effortless yet unforgettable meeting experience. Download our meeting planner here to plan the perfect meeting today. 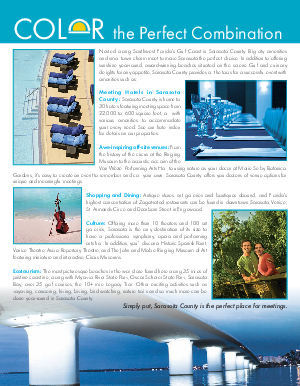 Visit www.SarasotaMeetings.org to learn more about what our destination can do for your next meeting.